The Timothy Smith Network (TSN) is a member organization of 34 active community technology centers established to help the people of Greater Roxbury effectively use and access technology by providing related services, educational programs, and resources. Since its establishment in 2001, the BNN Timothy Smith Network Media Lab has been unique among TSN’s community-based computing centers. While many centers offer training and public access to computers and the Internet, our Center focuses on advanced multimedia applications — tools used to create digital media content for distribution through BNN cable channels, reaching Boston homes and reaching a global audience through our website. Established by a 19th century Dudley Square merchant, the Timothy Smith Fund provides periodic upgrades of computers. 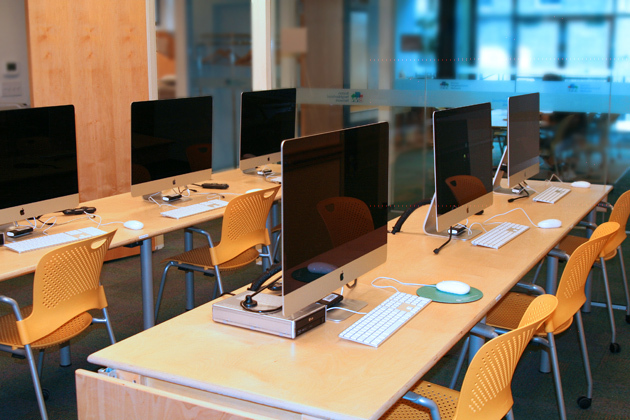 In 2018, we upgraded our Media Lab with 14 new Apple iMac 27” computers with the latest versions of hardware and software (including Final Cut Pro X) for faster, more reliable editing, 2 instructor stations and 12 student stations. At the BNN Timothy Smith Network Media Lab you can receive training and access to new communications technology and have ample opportunity to come to the lab to practice what you've learned in classes, work on projects and edit your programs. Combined with a transcoder and HD cameras, you will enjoy a tapeless digital workflow and easier distribution of programming to BNN cable channels and the web.